I created this project not just because it was required of me, but because I wanted to have a functional piece of art work that I created. I wanted people to be able to look into my cabinet and see a wonderfully crafted mug. 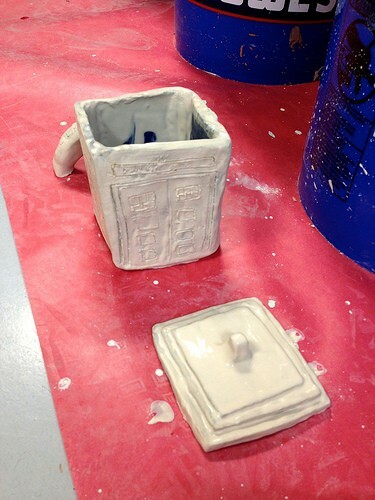 I made it a TARDIS because Doctor Who is my all time favorite television show. Some problems that I had when creating it was that it is a rectangular mug and not a circular mug so I had to take the size of the mug cut-out and divide the piece in half to created one side and then just trace that piece into the other slabs and cut out the other three sides. I also had to create a lid for the mug and it was hard because I had to make sure the lid went with my mug. To make the lid I traced the bottom of the mug into a thick piece of slab then crave out the edges to make the indentions. ANother problem is that the handle fell off when it was bone dry, so after the mug is in it's glaze ware stage I will glue the handle back on. If I could change something about my mug, I would make the designs symmetrical and take more time to make them look similar so they can look like the front. I created this coil pot because I wanted to have a decoration in my college dorm room besides posters. I am going to U.C.A. so I decided to paint it purple, black, and white. The face on the pot is because the mascot is a bear and they are ruthless. It was difficult to get the coil pot to expand because I didn't understand how to do it. To solve the problem I asked my teacher and he told me what to do along with an example by using one of my coils and (without slipping and scoring it) showing me what to do. When I was cutting out the crescent like shapes on the back, my coil pot started to crack. I didn't know what to do so I asked the teacher and he told me to take another small coil and add it to the area to give it more support. If I could change something about the U.C.A. coil pot, I would change the face from looking angry to looking more calm or happy because an angry face is distracting and I believe it takes away from the message of the exciting future college has in store for me(the colors represent the college i'm attending next year). 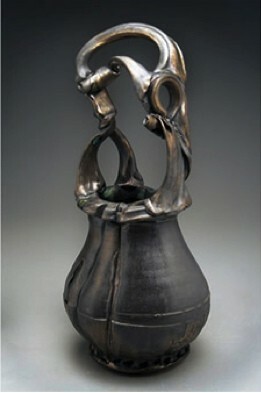 The pottery is pear shaped with a complex yet creative handle. The handle looks like it was melted on to the body.The piece has two holes, one on the left side at the bottom of the handle and the other in the middle of the handle stem where a piece runs off and connects on the other side to create a hand holding spot on the top. The pottery has curves and cracks (designed on purpose) and looks a little antique. The colors are dark but a nice blend of cool and warm colors(value). 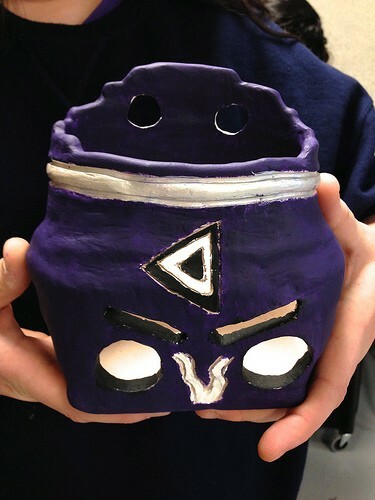 The pottery piece is a symmetrical and has a hole carved out which creates negative value. The texture seems smooth but on the far left of the picture( from our perspective) looks rough because of the ridged edges. There is emphasis on the handle because it is the brightest part and the most complex part with all the added on and the detail on it. The pottery piece seems like it was made using the coil process. The pottery has a very calm mood with a sense of rushing because of the color and the handle's complexity. I believe that this is a successful artwork because the piece is well balanced and the colors are mixed well. the piece also has very few to no flaws and the texture doesn't look unrealistic. The piece is very professional. "Free" is of a muscular man with his head down tied to a post. It is a burnt orange color. The man is barely clothed and barefoot. The knees are slightly bent and the man has what could be a miniature afro. Everything about the structure is close because every piece is connect from the ground touching the feet, the limbs being connected, the chin possibly touching the upper chest, and the hands being tied to the post that the man is leaning on. The lines of the sculpture distinguish the muscles of the man and the hairs on his head. The piece is a symmetrical. The piece is more than likely life size, maybe a little bigger. The color provides unity because it is one color but different shades of that one color. The emphasis is put on the man because he is the main object. The texture is that of a fine looking man one would see on television commercials(very realistic with roughness and smoothness all around). The piece lets off a very depressed and submissive mood because of the man's head being down and him leaning on the post. It indicates that he has been either in captivity or slavery for a long time and he is used to it and sees no other way of life. I believe the piece was very successful because the submissive man looks extremely realistic. The lines, texture, and color work well together to create an extremely realistic sculpture. the piece was crafted with great skill and time, each piece belongs and nothing looks out of place(like the leaning instead of a man standing tall when he is obliviously tied to a short post).